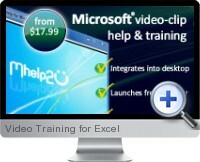 Video Training for Excel provides instant help and training for Excel through a set of purpose built video clip tutorials. Video Training for Excel contains hundreds of brief (1 to 3 minutes) help and instant training video clips for Microsoft Excel. Each video clip displays a single action and is fully indexed and searchable. Video Training for Excel downloads to your PC with a launch icon in your task-tray. Upon launching, the Excel training video clip opens at the right of your screen on top of the application you are currently using so you can watch each video clip and complete the displayed action at the same time. The transcript is under the video-clip whilst a voice over narration guides you through the steps and makes for fast and easy comprehension. Video Training for Excel is an efficient way to master Excel and a low cost option for providing in-house Excel training to employees.